The greater sage-grouse (Centrocercus urophasianus) is a large bird entirely dependent on wide-open spaces of intact and healthy sagebrush ecological communities. Male sage-grouse are most recognizable by the dance they perform in the spring to court mates. Males have remarkable tail feathers that fan and white air sacs on their chests that puff giving off unique sounds. The video above shows a male sage-grouse courting a mate on a site known as a “lek.” Females are less showy but their health is critically important for the reproduction and survival of the species. Once numbering in the millions in the Western sagebrush sea, greater sage-grouse have significantly declined from historic numbers by as much as 93%. The precipitous decline of sage-grouse is symptomatic of several factors all converging to make the sagebrush biome the most threatened landscape in North America. Public lands ranching, oil & gas drilling, climate change, fire, cheatgrass and expanding energy development are among the chief threats to the species. 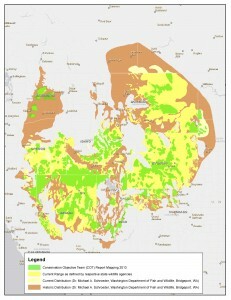 Western Watersheds Project has been advocating for greater sage-grouse to receive the protection of the Endangered Species Act (ESA) since 2004. After weaving back and forth through the courts, the U.S. Fish and Wildlife has finally agreed to provide a final determination about protecting the bird by September 2015. It is likely that the species will warrant protection, something many special interest industry groups would like to avoid. The federal land management agencies, the Bureau of Land Management and the Forest Service, are doing their part to develop management plans that will allow industry groups to maintain the status quo but which they hope will also demonstrate enough of a commitment to protecting sage-grouse that the U.S. Fish and Wildlife Service will determine that existing regulatory mechanisms are adequate, and that ESA listing isn’t necessary. Unfortunately, the new plans fall far short of that goal. WWP commented on all of the subregional plans released in 2013, and WWP found pervasive inadequacies in all of them. WWP’s comments centered on our area of expertise: the direct and indirect harms to sage-grouse caused by public lands livestock grazing. The agencies turn a blind eye to the widespread degradation cows and sheep are causing in sage-grouse habitat, instead focusing efforts to conserve habitat on more fencing and livestock improvements, seeding, and vegetation “treatments” like sagebrush manipulation, prescribed burns, and juniper removal that are certain to further fragment sage-grouse habitat. To assess grazing, the agencies uniformly rely on determinations of rangeland health (BLM) or monitoring data (USFS). But, as WWP has learned and demonstrated repeatedly, the BLM’s standards in particular are ineffective measures of livestock impacts and fail to capture the real problems with grazing, even when they are actually conducted! And much of the time, the agencies claim not to have the funding to fulfill their monitoring promises. Importantly, all of the plans relied on site-specific grazing permit renewal processes to implement any changes in livestock management, rather than incorporating specific, measurable objectives into the plan amendments themselves. But none of the plans admitted that grazing permit renewals are most often rubberstamped under Congressional riders that exempt them from review before renewal. It could realistically be decades before any on-the-ground measures from these plans are implemented. As a sage-grouse expert recently wrote, these federal agency responses to the greater sage-grouse and the ESA listing are “Getting nowhere fast.” WWP expects to be back in court on this issue until the sage-grouse, and the sagebrush sea, gets the protection it deserves.